How do we achieve a Better Peace? By including civil society, especially women, in peace negotiations and peace building and ensuring gender sensitivity in all processes. How do we make the Peace sustainable? By implementing peace agreements and ensuring that thematic topics addressed, such as transitional justice, devolution, and security sector reform are gender sensitive and inclusive. How is ICAN contributing? We develop pragmatic guidance, such as animations, discussion guides and trainings for the inclusion of women peacebuilders and offer proactive steps to broaden participation. Explores why gender sensitivity and inclusivity matter and how to pay attention to this in community policing initiatives. Explores the various components of transitional justice and offers five practical steps to a gender sensitive and inclusive process. Explores why gender sensitivity and inclusivity in devolution processes matter and how it can be done in practical ways. Presents a four-part framework for inclusive mediation, offers proactive steps to overcome common barriers. The animation explores the various components of transitional justice and offers five practical steps to ensure a gender sensitive and inclusive process. This animation explores why gender sensitivity and inclusivity in devolution processes matters and how it can be done in very practical ways. Descentralización de género: por qué importa y cómo hacerla aborda la perspectiva del genero y inclusión del los procesos de descentralización que son importantes y cómo se puede hacer de maneras muy prácticas. Un programme de décentralisation politique tenant compte de la problématique sexospécifique : pourquoi cela est-il important et comment y parvenir ? 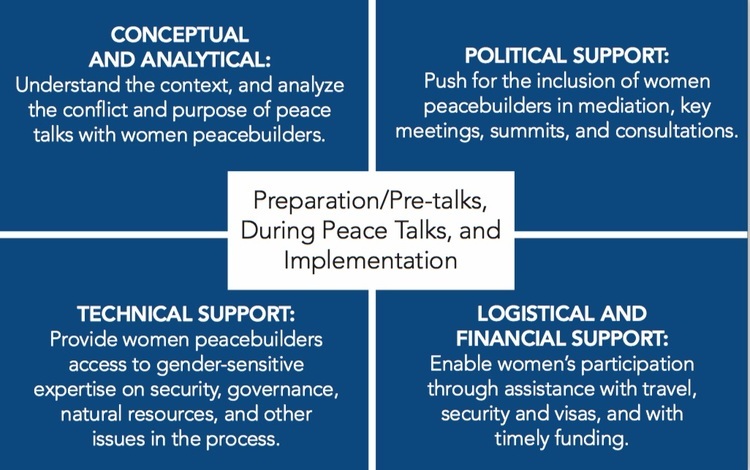 The Better Peace Tool presents a practical four-part framework for the inclusion of women peacebuilders, offering proactive steps to broaden participation. Un guide open source offrant des mesures concrètes pour l’inclusion effective des femmes artisanes de paix et les perspectives de genre dans la médiation, la prévention des conflits, et la consolidation de la paix. The Better Peace Tool explores the history and evolution of peacemaking in modern times. It considers six common barriers to inclusion and how to overcome them. El “instrumento por la paz mejor” explora la historia y evolución de la pacificación en tiempos modernos. Considera seis barreras comunes a la inclusión y como superarlas. ICAN’s Better Peace Tool video in Farsi/Persian explores the history and evolution of peacemaking in modern times and provides practical guidance for overcoming six common barriers to women’s inclusion. 10 Steps to Ensure Gender Responsive Processes & Ceasefire Agreements is a practical guidance document intended to inform governments, international organizations, and civil society facilitating local, national and regional ceasefire negotiations. Click here for more. 10 Steps to Increase Women’s Participation in Peacekeeping and Reduce Sexual Exploitation and Abuse is intended to put forth concrete recommendations from women-led civil society to improve community security and eradicate Sexual Exploitation and Abuse (SEA) from peacekeeping missions through effective recruitment and deployment of women. Click here for more. 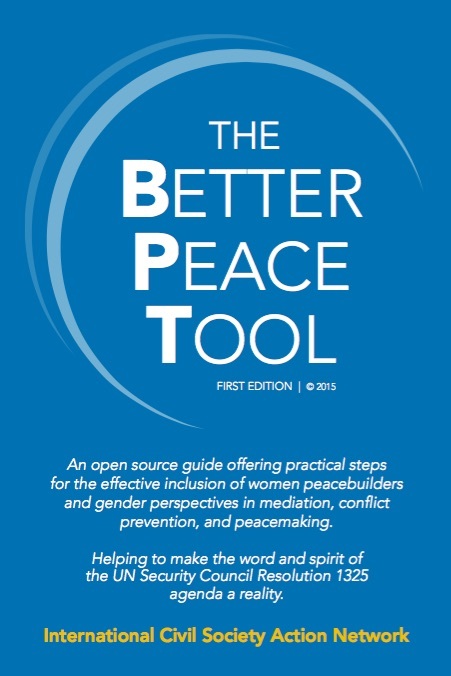 The Better Peace Tool explores the history and evolution of peacemaking in modern times. It considers six common barriers to inclusion and how to overcome them. And it presents a four-part framework for the inclusion of women peacebuilders, offering proactive steps to broaden participation. Click here to explore steps to overcome the six common barriers to inclusivity.